The System Ninja process manager provides a powerful way to terminate any process. It can end non-responsive programs far more effectively than the Windows task manager because rather than end the process, System Ninja simply denies it any memory forcing it to close instantly. The System Ninja process manager is a useful aid in the removal of malicious software from your computer. This is because it’s able to terminate multiple processes at the same time. To do this, simply select more than one item (hold Ctrl and click) before pressing the “End Selected Process(es)” button. By ending multiple malicious processes at the same you can effectively stop the program from being able to relaunch itself. The ‘End Process’ option (available by right-clicking on an item) instructs the process to end gracefully. It functions identically to the process manager built into Windows. The “Force Quit” option, on the other hand, is a far more brutal and effective way of terminating a process. It can forcibly end programs that refuse to close when quit through normal means. It can be used by selecting an item and clicking the “Force Quit” button in the bottom right-hand corner, or by right-clicking an item and selecting it from the context menu. The “Kill all instances” option works the same as “Force Quit,” however it kills every process with the same name as the selected process. 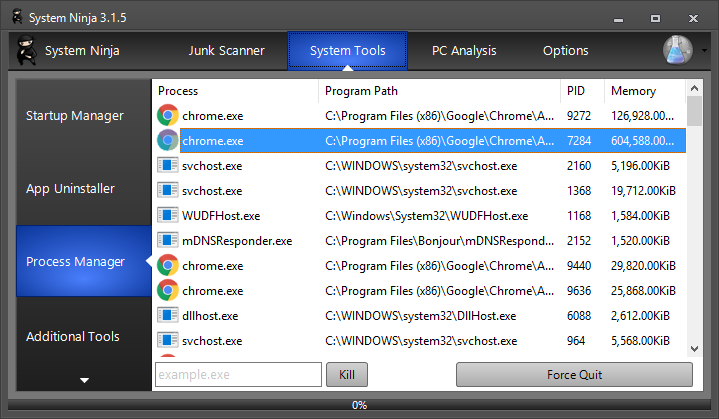 It is useful for killing programs that run multiple instances of itself, such as Google Chrome and Mozilla Firefox.